Make a decorating statement with leather furnishings. This bold design move shows you have skin in the game. Consider a touch of leather in your next decorating project. It will be a moo-ving experience that’s sure to enhance your home environment! And most leather design elements are practical too! Leather adds great texture, softness and color; however, beware that it can be a heavy look, especially in its most typical design colors – dark brown and black. That’s why it’s best to soften a big leather piece of furniture with other elements such as creamy paint colors, cushy throws and pillows, silky rugs and soft fabric furniture and window fashions. Another way to lessen the heaviness of leather design elements is to select a lighter color of leather, such as beige, white, gray or sage green. Or you can add a tidbit of brightness with green, red or yellow leather! Leather sofas and easy chairs, and even recliners! Add leather to your next design project and you'll be ahead of the herd! Design Studio Roman Shades.... you have got to see the new fabrics!!! Get creative with new custom soft Roman shades from The Hunter Douglas Design Studio Collecion. Choose from four distinctive styles, each designed and crafted with Hunter Douglas quality and innovation. Explore the New and Exclusive collection of artfully curated fabrics - sophisticated textures, patterns, stripes, rich solids and sheers. We have added many fabrics with updated colors and designs. Reflect your personal style by adding coordinating valances, tapes and trims, making your windows truly unique. Hunter Douglas Design Studio Roman Shades Redefined. At Hunter Douglas, the difference is in the details. Design Studio fabrics are woven in widths that allow shades to be made up to 96" wide without being interrupted by seams. Every shade offers high quality construction. Our innovative cording system reduces access to the rear cords for enhanced child safety. Clear rings coordinate with all lining and sheers, stiff battens provide structure, bartender tunnels are sewn to keep battens from slipping out and all hems are double-turned for a custom finished look with bottom hems weighted for a smooth appearance. Batten Front Roman Shades are characterized by battens or tunnels sewn at regular intervals on the front facing side of the shade. The clean, dimensional lines of this style work well in all environments. When a stripe or pattern fabric is selected, batten front is a great choice because the battens on the front won't interfere with the pattern. Batten Back Roman Shades have inverted tunnels that create a soft, tailored look when lowered and defined folds when raised. This simple style requires the least amount of dressing when raising or lowering the shade... looking great in any position. Flat Roman Shades have no horizontal seams or stitching across the face of the shade making them the best choice for showing off large-scaled patterns and striped fabrics. Hobbled is a classic style defined by soft fabric folds which cascade from top to bottom. Design Studio Hobbled Shades have a unique, triple-layered fabric construction with a double lining, providing unsurpassed energy efficiency. Do you require privacy? Room darkening? Or would you like the light to gently filter into your room?The uniquely edited collection of Design Studio fabrics work for all your windows, whatever the need. You have a choice of lift system-Cord-lock, continuous Cord, Ultraglide lift system and PowerView only from Hunter Douglas. We recently helped a customer in Plano. Her family room sliding Doors look out onto her pool patio and beyond to a wooded area. She wanted to be able to raise her shades to give her full view of the beautiful spot so we decided the best solution for this project was Design Studio Roman Shades by Hunter Douglas. For ease of operation we selected the PowerView Motorization. She used the Hub and set the shades so that they raise to a certain spot every morning and lower every evening. For an additional touch be added a custom cornice to cover all shades using a textured fabric. This was a solution both the customer and I love. Let Read Design Southlake or Read Design Plano help you with you next custom window fashion project. Our Designers will be happy to come out to your home and give you ideas. If you are wanting just shades, shutters, blinds or are wanting to add Drapery Panels or Valances and Cornice boards, we will help you find the perfect solution. We service these areas - Plano, Southlale, Dallas, Fort Worth and all areas in between! With Hunter Douglas, beauty is more than skin deep, but first impressions always matter. That is why innovative textile sourcing is a crucial part of our design process and it's why we've established relationships with some of the worlds best mills. We work with textile houses to develop and design exclusive materials that are as special as our technological innovations. That means fabrics that subtly reflect and control light in intriguing ways. Richer, more fashionable colors, luxurious weaves and unusual textures, even special characteristics like Hunter Douglas' MicroShield Antimicrobial fabric protection. In all, Hunter Douglas has created a collection of more than 300 timeless fabrics, woven with the finest blends of cottons, linens, silks and synthetics to add beauty, style and enhanced livability to every room in your home. You can see all the colors and textures in many Hunter Douglas products including Design Studio Roman Shades and Vignette Modern Roman Shades. Customized through pattern and texture, these shades are expertly crafted to order and offer elegant window coverings in more than 300 exquisite fabrics. From sophisticated designs, textures and stripes to solids in blends of cotton, linen, silk and synthetics. VIgnette Modern Roman Shades are clean and sophisticated, beautiful and functional. Because they come from the world's leading maufacturer of window fashions, you know your Modern Roman Shades are built with attention to every last detail - and that's just the start of the many reasons to choose Vignette Modern Roman Shades. What makes a Modern Roman Shade? They are VERSATILE - choose from three styles that roll, stack or traverse. There's a style for every window in the house. They are SAFE - with no exposed cords on the front or back of the shade, these window fashions enhance child and pet safety in your home. They are DURABLE - finely crafted woven fabrics are easy to clean. Choose from many fabric collections and over 100 different fabric options all requiring low maintenance. They are BEAUTIFUL - you choose a style, 4" full folds or 6" flat folds. Either way, we've made sure they retain a consistent appearance with every use. They are INNOVATIVE - discover an extensive selection of proprietary operation systems available only with Hunter Douglas. They are QUICK - it is easy to order and the delivery is fast. They are HANDCRAFTED QUALITY - every shade is backed by the Hunter Douglas Limited Litetime Guarantee. Here are a few of our many shade installations in Dallas, Southlake and surrounding areas. Let Read Design help you with your next Roman Shade project! Now is the time to stop by Read Design Plano or Read Design Southlake and see all of the new Hunter Douglas products. 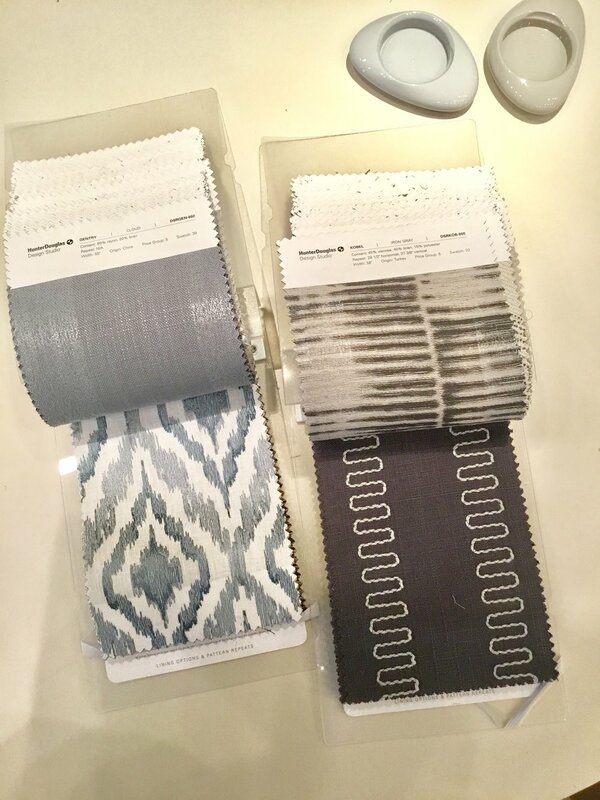 We have brand new Vignette Modern Roman Shade fabrics! We have over 60 working samples of Hunter Douglas products including the Exclusive Alustra Collection. We can show you all of the features and benefits of the products and lift systems including the new PowerView Motorization. We are also getting new fabrics every day for your next drapery or curtain project. Or just give us a call!